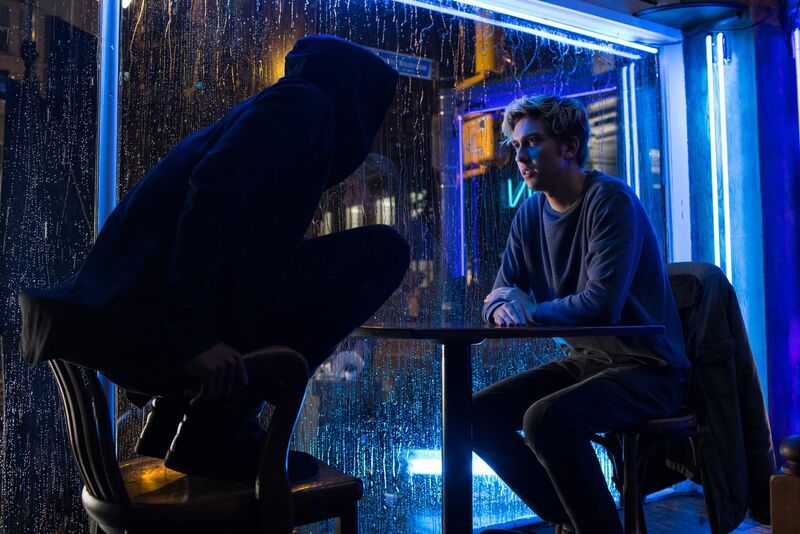 Nipping at the heels of yesterday’s morbid teaser trailer, the first official still for Netflix’s Death Note adaptation has arrived and in it, we see Light Turner (Nat Wolff) have a fateful encounter with the world-famous detective known as L.
Cloaked in a jet-black hoody and facing away from the camera, we don’t actually get to see L’s face here, but those familiar with Tsugumi Ohba and Takeshi Obata’s iconic Japanese manga will no doubt be able to identify his signature pose. Indeed, when Death Note premieres in August, Light and L will find their lives inextricably bound by the titular notebook, which holds the bone-chilling power to kill anyone whose name is scribbled down on its page. Originally called Light Yagami in the manga, once he comes into possession of the Death Note, Nat Wolff’s unassuming student moonlights as a vigilante, picking off a series of known criminals from the safety of his bedroom. But as our unlikely hero quickly begins to realize, each action has an equal and opposite reaction, and it isn’t long before his dalliance with death summons forth Ryuk the Shinigami (Willem Dafoe). Margaret Qualley, Lakeith Stanfield, Paul Nakauchi and Shea Whigham co-star. Not unlike Ghost in the Shell before it – or The Great Wall before that – the English-language Death Note has come under fire, with commenters labeling Netflix’s adaptation as another example of Hollywood whitewashing. Whatever side of the fence you find yourself on, or even if you find yourself perched in between, you can find the official synopsis, below. “The human whose name is written in this note shall die.” Netflix is set to unravel Adam Wingard’s R-rated Death Note adaptation on August 25th.